The College of Surgeons of Sri Lanka and the Neurosurgeons Association of Sri Lanka are pleased to announce that the first International FRCS examination in Neurosurgery will be held in Colombo, Sri Lanka from the 21st to the 23rd of February 2018. 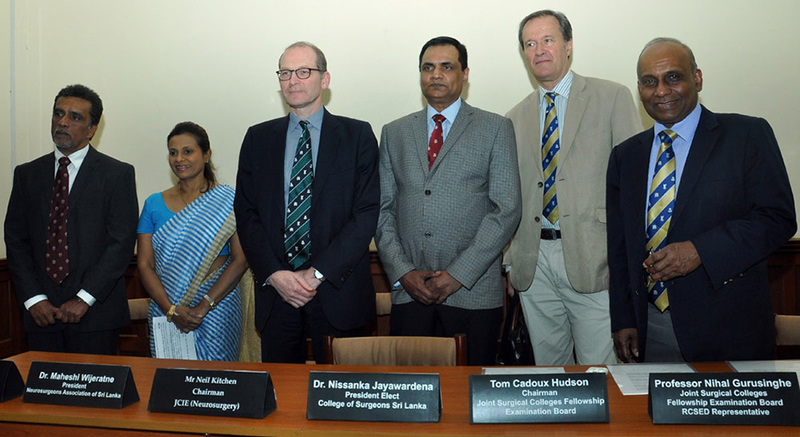 There are historical links between the College of Surgeons of Sri Lanka and the Royal Colleges of Surgeons’ UK and Ireland. This prestigious event is being organised in conjunction with the Joint Surgical Colleges Fellowship Examination (JSCFE) Board and the Joint Committee on Intercollegiate Examinations (JCIE) Board of the Royal Colleges of Surgeons in the UK. Forty-four candidates from different parts of the world are sitting the examination with a contingent of eighteen senior Consultant neurosurgeons arriving from the UK as examiners. The meticulous selection of the clinical cases as well the organisation and coordination of patients were undertaken by the Neurosurgical Association of Sri Lanka. The clinical component of the examination is being held at the renowned Brain & Spine Centre at Asiri Central Hospital, Colombo. The viva section will be held at the Taj Samudra Hotel in Colombo. The unique opportunity to host this inaugural event in Sri Lanka will tremendously enhance the international profile of the neurosurgical services in Sri Lanka and help to enhance the academic reputation of the country. The organisers are grateful to the Director National Hospital, Colombo and the Ministry of Health, Sri Lanka for approval to host the examination. We also wish to thank the patients, nurses, doctors, interpreters and coordinators, who are assisting the examination.